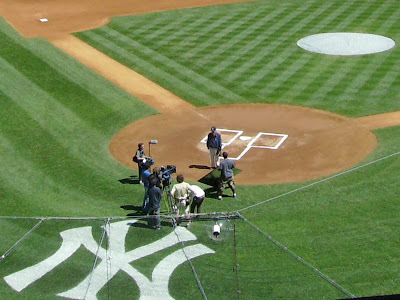 I just wanted to take a minute to recognize that today, Sunday, September 21, 2008 is the day of the last game ever to be held at Yankee Stadium. I've never really cared too much about baseball, but my mom loves it, and I won't deny that it is sad, even to me. My mom and sister are really the only reason I know anything about this, and they were lucky enough to be able to attend all six games of the Yankee's next to last home stand. 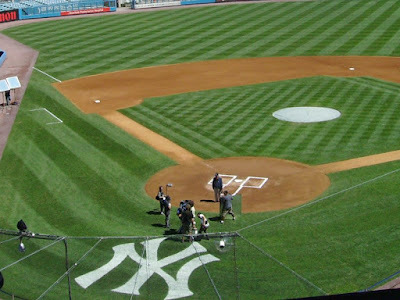 They also went on a stadium tour and saw Yogi Berra taping that commercial they've been playing about the stadium. 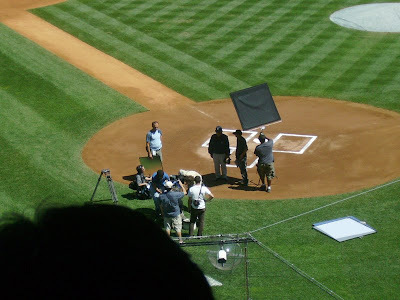 The images shown above are of Yogi Berra and a camera crew and were taken during the tour.